This is a political advertisement ran in the Southern Illinoisian paper on March 14, 1976. The literature pertains to the 1976 Illinois Governor Election. It was a privately funded ad paid by Southern Illinois Voters and Tony Ison of Mt. Vernon. The entire page is dedicated to Walker's record in his first term of governor in 1972. Much of it relates how he has made decision which have positively affected Southern Illinois. The Southern Illinoisian is based out of Carbondale reporting on local matters, not just political. In 2013, it changed over to The Southern, and has grown in influence and readership, being used by many graduate students today for scholarly research. It continues to focus on current issues including a recent controversy on excessive police force in Metropolis, Illinois. As for Dan Walker, he is war hero and veteran who is most famously known for walking the entire State of Illinois during the 1971 election. Walker lost in the 1976 Democratic Primary to Michael Howlett, a Mayor Daley backer. Walker went on to be convicted of bank fraud in the late eighties and spent only a year and a half in prison due to time served and the justification of faith healing, despite being sentenced to seven years. 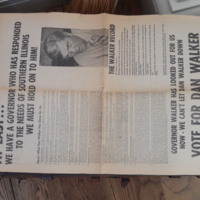 Southern Illinoisian , “Dan Walker Campaign Ad for Governor's Election in 1976,” UIS History Harvest, accessed April 19, 2019, http://uishistharv1.uis.edu/items/show/219.